So I have this thing about empty rooms in the witch’s house and I put this shiny red lacquer furniture in there to not have an empty room, but its been bugging me… So much so I don’t think I have posted many photos with this room included. The shiny red furniture is ok don’t get me wrong and even though the hutch does not have back legs it still rested nicely against the wall. 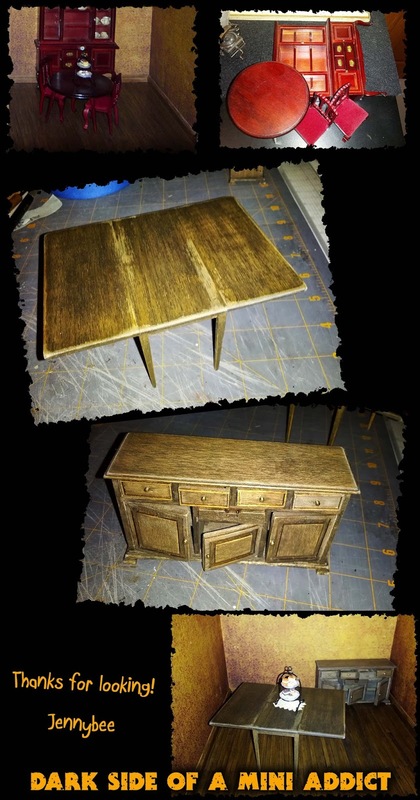 Then out came the box of furniture kits and after some rummaging I found a dinner table, buffet table and cabinet that looks like a writing desk with drawers but has a 2 door cabinet with shelves up top. If you click on the photo to make it larger you can see I have used my standard making things look older technique. This includes watered down shades of black and brown paints, sanding, more watered down paints, sealer and even more sanding. The cabinet is still on the craft table with clamps on it while the glue dries. But so far I think it will look better in the room once it’s all complete. This room will also have a theme…….. It will be the party room all decked out with candies and party favors including a few surprises from my dear friend Jane!! No photos of those yet but they will soon follow, then I can add things like cobwebs and octopus tentacles. Yepp that’s what I said. I love when a plan comes together! !